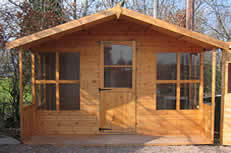 All of our wooden sheds are made from high quality timber. 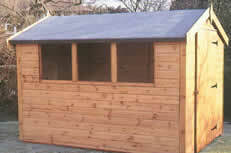 Each shed is made to order so you can have the exactly shed made to your specifications. We have a selection of styles to help you decide but if you’ve seen something elsewhere chances are we’ll be able to help. Our summerhouses are becoming more and more popular every year and you can see why. Perfect for those summer evenings and weekends. The kids will love them as well. 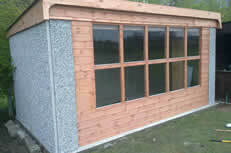 With a choice of sizes and finishes we’ll hand build your summerhouse to your specification. Our affordable concrete garages offer greater security. With several options and extras available you’ll find the perfect garage to suit your needs and budget. Remember that all prices include delivery and installation. Contact us today for a free quote. Really happy with the shed I bought from Derby Sheds. I can’t believe how quick the installed the shed. It took no longer than 45 mins for a 12×10 ft shed. Much better quality than what I’d seen elsewhere. Gary is a top guy as well. Would definitely recommend. Had one of the beautiful summerhouses, looks absolutely fantastic in my garden. Thank you very much.